Not to be confused with Hollywood. Holywood (/ˈhɒliwʊd/ HOL-ee-wuud) is a town in the metropolitan area of Belfast in County Down, Northern Ireland. 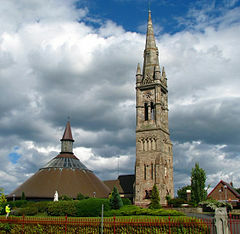 It is a civil parish and townland of 755 acres lying on the shore of Belfast Lough, between Belfast and Bangor. Holywood Exchange and Belfast City Airport are nearby. The town hosts an annual jazz and blues festival. ↑ "The Online Scots Dictionary". Scots Online. Retrieved 26 September 2016. This page was last changed on 12 August 2018, at 21:21.